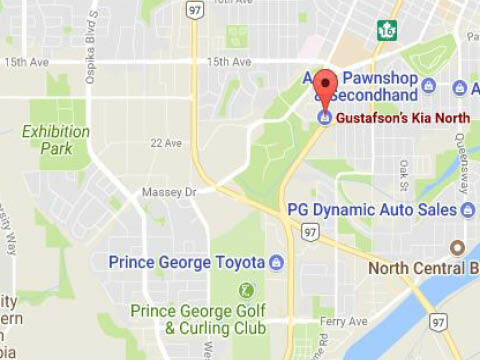 With two convenient locations in Prince George and Williams Lake, Gustafson's Kia couldn't be easier to get to when coming from Quesnel. At Gustafson's Kia, we are proud to serve the Northern British Columbia area as your online Kia dealer in the north. We take this designation very seriously and treat all of our customers like family. Our friendly and knowledgeable staff is happy to help you find the Kia Soul for sale near Quesnel of your dreams that fits both your lifestyle and your budget. Come visit us at either of our locations today at 112 North Broadway, Williams Lake, BC or call 250-392-2305 and at 1912-20th Ave, Prince George, BC, 250-563-7949. Having two dealership locations means access to a greater inventory of new and used Kia Souls for you to choose from. We are certain that you'll find exactly what you're looking for when you choose Gustafson's Kia. Feel free to browse our extensive inventories online before booking a test drive and coming in. We are happy to answer any questions you may have about any of our vehicles in person, over the phone, or through our Contact Us form on our website. Turn heads when you drive past with the Kia Soul. Wider and more aggressive styling on the front bumper and grille follow through to the rear bumper with available silver accents for a lasting impression. Available Xenon HIDs and LED daytime running lights add to the already enhanced clarity and projection of the headlights to help you see the road ahead while driving at night. Stand out from the crowd in the Kia Soul. Stay safe in your new Kia Soul for sale near Quesnel with standard advanced dual front, dual front side, and dual curtain airbags. You and your passengers will be cushioned on three sides in the event of an impact. Available safety features can help prevent a collision before it happens. Blind Spot Detection keeps an eye out for vehicles hidden in your blind spot and alerts you to them while the Autonomous Emergency Braking system kicks in and applies full braking assistance when it detects an imminent collision. For your added convenience and entertainment, the Kia Soul features an available Harman Kardon premium audio system and sound-reactive speaker lights for your choice of available 6 or 8 speakers. Stay hands free with available Bluetooth hands-free technology and smartphone integration via Android Auto or Apple CarPlay. You'll be able to listen to music, make a phone call, and access navigation without having your hands leave the steering wheel so you can focus on the road.